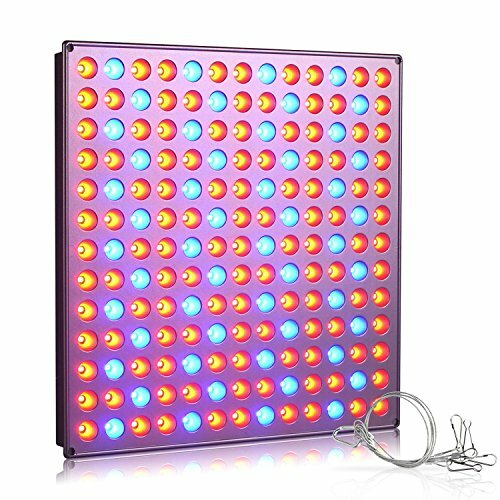  Most Useful Grow Light Spectrum Adopted-- Design with 117pcs red leds (660nm wavelength)+52pcs blue leds(450nm wavelength). Red Light-Facilitates the synthesis of plant carbohydrates and accelerate plants' development;Blue Light--Increases chloroplast activity and effects a lot on Photosynthesis.  Professional Spectrum Ratio: Red:Blue=2.25:1, according to hundreds of growing practices, this ratio can provided the most useful light to help plants growing.  So Easy to Get Full Harvest: this led grow light bulb can rapidly improve the health of plant and growing, generally more leaves will pop up with 12 days of using this growing lamp on a daily basis. It is recommended to cover an area of 7-10 square feet and be hung at around 18'-48', depending on the cycle of your plants are in. ⚡ Higher Power Conversion: Low power consumption with high luminous efficiency, use thick aluminum alloy plate to reach a better heat dissipation, won't burnt your seeds and plants during using. Long service life up to 50,000hrs. ✅ Roleadro is an led grow light manufacturer with 10 years Research and development experience.We can provided you the relaible quality that we always stand behand.18 months warranty and 30 days lightning money back.